This stunning Forever Diamond 18 carat white gold solitaire ring features elegantly twisting shoulders inlayed with diamonds leading to a prominent solitary diamond on the rings head. This truly unique design has diamonds totalling 1/3 carat and is exclusive to H.Samuel. The Forever Diamond has a unique 73 facet cut, delivering exceptional sparkle and radiance. Each Forever Diamond has been independently certified by the GSI for colour, clarity, carat and cut. 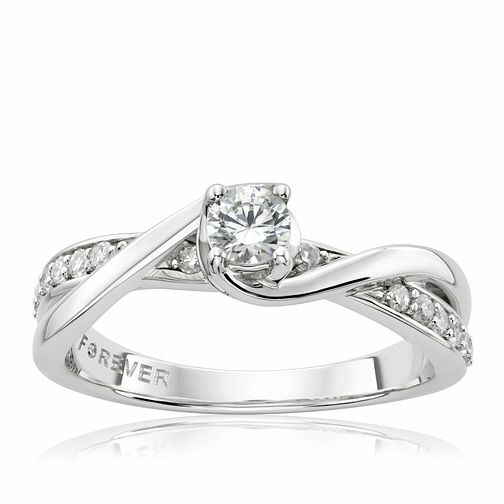 18ct White Gold 1/3ct Forever Diamond Ring is rated 4.8 out of 5 by 6. Rated 4 out of 5 by Anonymous from Did the trick! Very nice ring, well presented. Ordering and delivery were simple.